RIBS Supporting Queens of the Stone Age in Richmond, VA. 12/16/13. Doors at 6:30, show at 7:30. 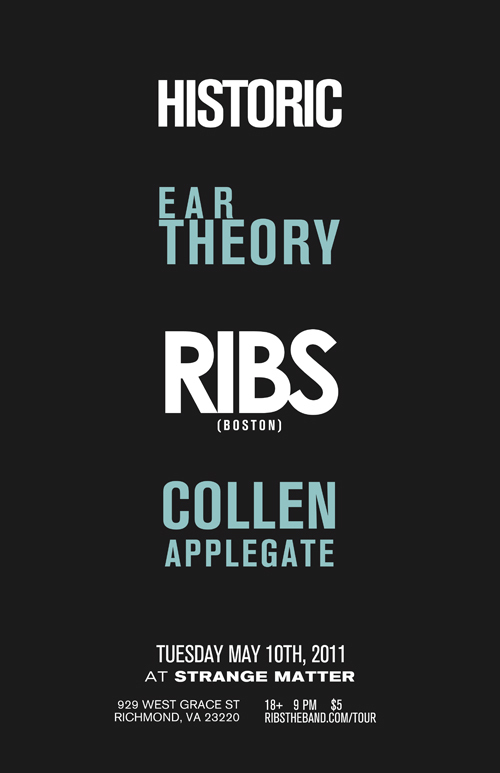 On Tuesday May 10th, Strange Matter will host a show that will feature Historic, Ear Theory, RIBS, and Collen Applegate. I had the chance to catch up with three of the members of RIBS, a Boston-based band who is playing in Richmond for the very first time. Y’all make them feel welcome, ya hear? RIBS is Keith Freund on vocals and guitar, Blake Fuslier on bass and vocals, Justin Tolan on guitar, and Chris Oquist on drums. Keith and Blake grew up in Atlanta, and then transferred to Boston for school at Boston University. They heard about a “shred guitar prodigy” by the name of Justin Tolan who was, incidentally, also from Atlanta. Talk about fate. Keith and Blake weren’t to meet Justin, however, until Keith responded to a “band wanted” ad that listed Radiohead, Muse, and Aphex Twin as influences. As it turns out, it was Justin’s ad, and the two became three. A little later, drummer Chris Oquist joined the band and they started making music together. Now they are a band on the move, nominated for The Boston Phoenix/WFNX Best Music Poll and named one of The Boston Phoenix’s Eleven Bands to Watch in 2011. Enough bio stuff. Let’s get to the interview. OK guys – what the heck does RIBS stand for? Why the mysterious capitalization? Then you won’t mind if I make something up for all those curious Richmonders? I’ve read about how you guys met and how the band started, so I’ll skip those questions and go to my number one favorite question I love to ask musicians. What was your FIRST favorite album? Keith: Beach Boys, Greatest Hits. Keith, I’ve read that many of your musical influences haven’t made their way into your music thus far. Do you see the Beach Boys making into your repertoire somehow? Keith: [chuckle] Not any time soon. Blake: Outkast, ATLiens. I really didn’t start LISTENING to music until I was a teenager. Keith: When I was a kid I listened to oldies with my parents. After that, radio rap and other stuff. I developed my own taste later. Justin: Mellon Collie and the Infinite Sadness by Smashing Pumpkins. I was seven years old and my sister had been listening to the album and didn’t want it anymore. I loved it, but my parents went through with a sharpie and marked out the eff words in the liner notes.